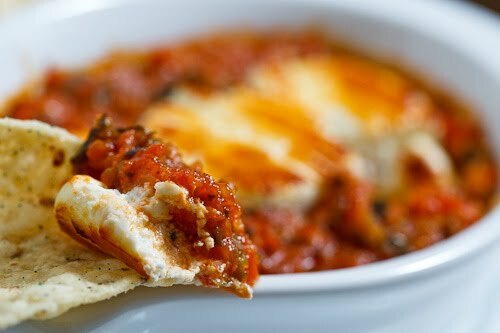 Not too long ago I discovered a great new appetizer, the baked goat cheese marinara , where the goat cheese is baked in a marinara sauce and it is then served with toasted baguette slices for dipping and scooping. While I was enjoying the baked goat cheese marinara I thought that this would also probably work well with a salsa ranchera swapped in for the marinara sauce. When I look at the the recipes for a marinara sauce and salsa ranchera they are pretty similar save for the use of the chili peppers so I figured that it should work out pretty well. For the salsa ranchera I went with a simple version with some roasted serrano and poblano peppers. The baked goat cheese salsa was excellent! The creamy and tangy goat cheese went really well with the fiery hot salsa. I like the way that the goat cheese retains it shape only to crumble into melted cheesy goodness when touched. Although I am pretty sure that the baked goat cheese salsa would go great served with toasted baguette, I went with something that seemed a little more appropriate, tortilla chips. Since the baked goat cheese salsa had so few ingredients I wanted to make sure that the salsa ranchera was a tasty one. Although I like the ease of the jalapeno salsa ranchera I wanted to add a bit more flavour and I did so by using a variety of chili peppers including serranos and poblanos and by roasting them. Had tomatoes been in season, I would have roasted some fresh tomatoes as well but since they are not I went with canned tomatoes this time which is perfectly acceptable. I finished the salsa renchera off with some fresh chopped cilantro and a splash of lime for some freshness. I pureed the salsa in a food processor to ensure that it was nice and smooth for the baked goat cheese salsa. Place the salsa in a baking dish and top with the goat cheese. Broil until the goat cheese is soft and golden brown, about 4-6 minutes. Add the chillies and tomatoes and bring to a boil. Reduce heat and simmer until the sauce thickens about 20 minutes. Remove from heat and stir in the cilantro and a squeeze of lime. wow…i want some NOW. that looks amazing!!! Oh that baked goat cheese just looks wonderful! 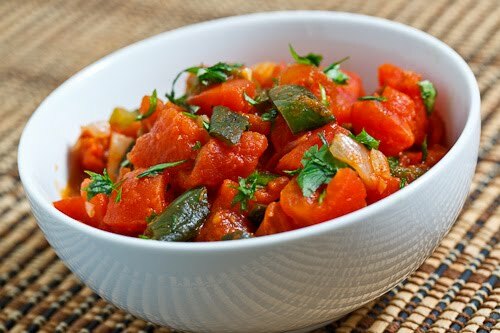 And I love cooked salsa… well, ok, I'll take my salsa any way there is, but cooked is a great change from the fresh salsas that I usually have! This post makes me really hungry! I'm glad to see your ladies so supportive, please , ladies, try his recipes too !!!! he is so good and so are most every recipe of his that I have tried – try them!!!! This looks just a great as the goat cheese marinara. Wonderful! Kevin, this is outstanding. The best grub out there!!! Amazing! I want it now! 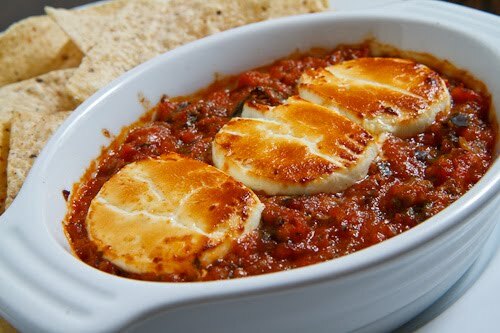 Baked goat cheese sounds delicious to me right now…creamy and cheesy and melty…mmmm. Love the salsa you made to spice it up! WOW, This looks amazing. I am really impressed by your photography! Ah, this sounds so yummy! But I must ask, how did you mention to make anything "fiery hot" with three peppers? Two, really, as poblano peppers honestly don't count for much at all. Still, the idea was fantastic! Next time try a handful of some real peppers instead! I love goat cheese with spicy Mexican food. This sounds delish! Now, THAT's something you aren't going to run into at every party! For my next one, instead of just mixing pesto into goat cheese and putting it out in a bowl, I'll try this (if I can manage not to eat it before the guests arrive)! this looks so yummy, i feel really hungry now! Your posts make my day. You're terrific. Thanks! I am loving this salsa! Fabulous Kevin! Sounds tempting, Kevin!!! Never served goat cheese this way before. Will try this when we get back from the skiing trip! Great idea-this is exactly what I want over the weekend…too bad it's only Tuesday. Nom nom! I've never liked goat anything, but the salsa looks great! Just started my own food blog and with a horrible digital camera my photos are just awful. What is the secret to your amazing photography? I love the recipes, but the photos are incredible. This looks absolutely delicious. I love goat's cheese but have never tried it in anything like this fashion. Will definitely give it a go. Fay Royle: I don't know about a secret, just lots of practice and looking at other others photos. One tip, have lots of light. I normally use a lamp or off camera flash as I do not get much in the way of natural light in my place. Great dip. Looks very hearty and delicious. I've always loved goat cheese but I didn't know this kind of combination. But the sauce sounds so delicious it must be good together. I have to try it. I made this for a party last weekend and it was DELICIOUS! It was devoured in less than an hour. Thanks for the recipe! Oh my, this is heavenly. Goat cheese is one of my favorite foods and I never thought to use it like this before. Yum! I made this last night and it was delicious. didn't look quite as good as yours, but the taste, oh my. It's the closest to heaven that I'll ever be. There's a tapas place nearby that makes this and it's just heavenly! Now I have a recipe to make it at home. I love goat cheese and salsa. the best of both worlds. Thank you. Dear kevin, you are simply the best.Thank you for all your wonderful recipies.